Your basic record show: dimly lit space, bins, old guys, hipsters, and…oh yeah, records. Let’s take a break before yet more OMD posts. Other things have been happening and one of the that merited commentary was the first record show in my sleepy town in over four years. Just like the last one, this one was held on a… Saturday? The venue was not the typical hotel ballroom but a venue, like the brief run of shows that I had attended in 2009-2010. Unlike the Asheville Sound Swap shows, this was not held at The Grey Eagle. This was held at the Asheville Music Hall; a venue near the heart of the downtown. Unlike The Grey Eagle venue in the more remote [yet trendy] River Arts District, the Asheville Music Hall was on Patton Avenue, which meant that I had inherited the Asheville Parking Problem® in wanting to attend this show. Three of the downtown city lots were full on a bustling Saturday of September 30th. The last lot I checked [library/civic center] had space available. So I entered and spent 8-10 minutes in a queue of three, slow-moving cars attempting to park. Level 1. Level 2. Level 3. Level 4. Finally, spaces were on Level 5. Then I hot-footed it across downtown to the venue; a ten minute jaunt. I entered the smallish [300 cap. I’d guess] club to see about a dozen vendors set up in the long, narrow room. 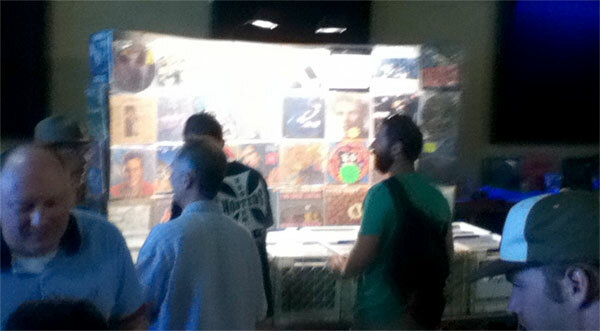 If you’ve never been to a record show, the photo above captures the basic gist of things. Big vendors have large tables with particularly rare wares displayed [and hopefully illuminated] on a large standing display. Bins thick with records sit on the tables and you have to sometimes wait to move to another bin to browse until the others move on. A quick once over revealed the sight below: Monk-bait of a high caliber. Maybe I should start with these four bins? Diving into these bins revealed that they came by the bin labels honestly. Most of the stuff inside was definitely 80s New Wave. I saw a lot of things that I didn’t need or want, but at least they seller had alphabetized the bins; a helpful courtesy. Prices were on most of the bags and I have to say that they were trending high. Albums that I might want to part with $3-5 for were instead in the $10-15 range. Albums like this one. Though chasinvictoria is now twitching painfully as he reads this, I might have bought a copy of “No Wave” for as little as $5.00, but there was no way I was going to squander 60% of the scant cash I had allotted to attend this show [this Monk had definitely taken vows of poverty what with all of the concerts, trips, and company we were neck deep in during this time] on an album which didn’t actually offer any music I didn’t already have on CD. I continued rifling through the bins. I did see this Gary Numan 12″ [left] that I can’t say that I had ever seen before. 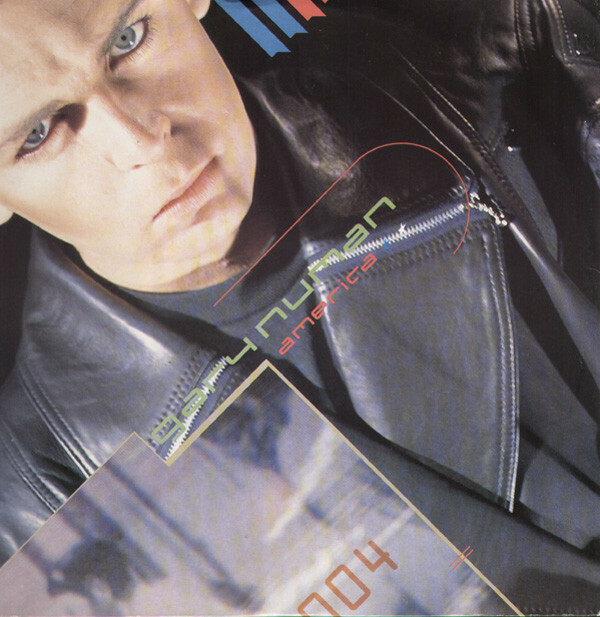 I’ve cooled on Numan but I have the “New Anger” album [“Metal Rhythm” in the UK] and it was the best of his IRS era. No extended remix and this disc was…$15. Can you detect a pattern at this dealer? I moved on from the “N” section in this dealer’s bins. Nothing much to see but then I came across something that stirred deep memories I’d almost long since forgotten. 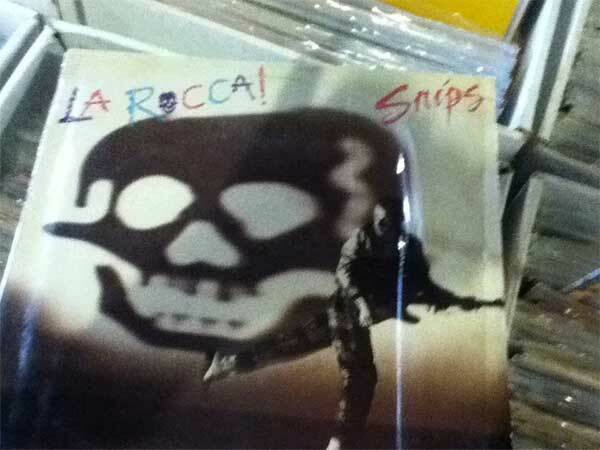 Snips “La Rocca!” I had read a review of on its release in 1981. I remember seeing a review of Snips “La Rocca” in the pages of “Rocks Off,” one of the FM-Rock freebie music papers of my teenaged years. I remember the review made it sound interesting, so I picked it up. The disc was not bagged, and there was no price sticker on it. Irritating. I slid the disc out of the cover to find that it had no inner sleeve; lovely! It looked dicey. I put it back and continued looking in the S-Z portions of these bins. Nada. I looked at the other dealers’ tables. After this many years, one can quickly sense if someone will have anything that is of interest for sale. 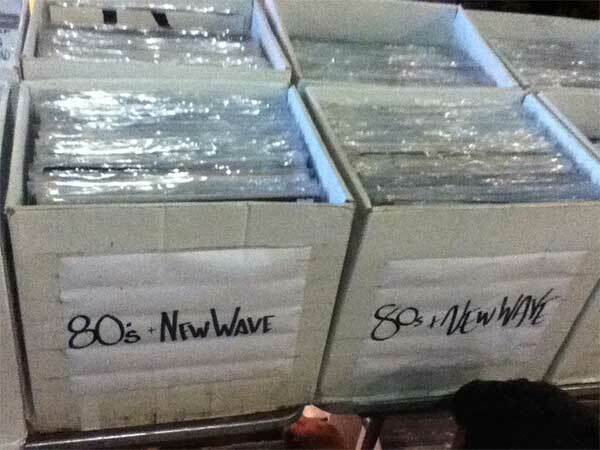 You have to look carefully because one dealer’s “punk” bins would be another man’s “new wave.” Nothing in the 12″ bins was calling to me. There were 7″ bins and I can be all about the right 7″ records, so I investigated the few there. Lots of dull, modern indie rock. But wait! One dealer had the 1978 yellow-vinyl re-issue of The Residents “Satisfaction!” I’d buy that, but not for the $20 asked. These prices here were definitely cresting the median asking prices on Discogs. Delusional Dealer Syndrome! I looked at some other 7″ bins but they featured well-thumbed [though seminal] punk records with $60 price tags on them, so I was about to leave this charade. I had been there for about 15 minutes and maybe I could get back to my car and leave before I had to pay to park [the first hour was free]. On a whim, I stopped back at the Snips record. I asked the dealer how much. I was hoping $3.00-$5.00 and when he said “records with no stickers are $5.00” I quickly paid and left. I got back to the parking garage with eight minutes left. Unfortunately, there was a jam of about 12-18 cars queued to leave and there was no way that I was going to escape without paying a dollar, scratch that! $1.25 for my “second hour!” It looked like rates had been raised. All together, it was an endeavor hardly worthy of the nearly two precious hours of my Saturday [I had to drive into Asheville from my job, where I had worked for a half day prior] that it had cost me to attend. Most of the stock was not compelling to me and the prices were decidedly unrealistic; they spoke of ripping off green hipsters now buying “vinyls” in this new and disgusting resurgence of the PVC music carrier medium. I had to admit, when I got home and researched the Snips record it looked like I had snagged the only winner in the place. “La Rocca!” sported: bass by Jo Julian [John Foxx, Berlin], engineering/synths by Duncan Bridgeman [John Foxx, Gardening By Moonlight], produced by Chris Spedding and Midge Ure [! ], and the creme de la créme… synthesisers by Bill Nelson! Oh yeah! This was one record steeped in some heavy pedigree! I hope to actually hear this one soon and report back with my findings. Since it hailed from the holy year of 1981, it could even be life-changing! Maybe tonight. This entry was posted in Record Collecting and tagged 1981, Bill Nelson, Midge Ure, Record Show. Bookmark the permalink. Never heard of Snips I must confess,but the pedigree of the contributors is impressive,as you say. Shame the experience of acquiring it wasn’t as good as expected. I just missed out on a record fair in Jersey,Channel Islands last week when I was on holiday,it was two days after I left,which is a shame as in my rural part of Wales there is nothing like that about to happen any time soon. Gavin – Congratulations on beating Echorich to the comments on this one! I am 100% certain he’s had this since 1981 and will soon weigh in with his thoughts. I suspect that it will sit on a shelf with Zaine Griff albums. We shall see. $20 for Satisfaction on “piss yellow” vinyl! I got this as a freebie for joining the Ralph Records mail order list…ok, maybe it cost me $1 postage which I sent in cash in an envelope way back in 1980, along with a 7″ EP Buy or Die 1980. THAT EP had their big four: MX-80 Sound – Don’t Blame It On Me, Snakefinger – Here Comes The Bums, Tuxedomoon – 7 Years and of course, The Residents – The Festival Of Death (Excerpt). Those are two of my most prized vinyl possessions. As for Record Shows, with the Hispster-ization™ of vinyl over the last 10 years or so, dealer prices have become usurious and the quality of those cardboard boxes less and less impressive. I’ll stick with record stores which, among all the dross, still contain some gems – even ones the stores don’t realize they have. Although my quest is to own ALL the copies of A&M’s No Wave (the record referred to in the picture), even *I* would pass on that unless it was a different pressing (like the Canuckistan version) at that price. Perhaps the dealers accidentally used a pricing gun that worked in PESOS?? (and yes, I have said exactly that to a dealer or two over the years!). Bill Barnett – I had no idea that Snips and Spedding had reformed Sharks, though nothing surprises me any more. I’ve been aware of Sharks for nearly 40 years, but have never had the pleasure. Since Spedding is involved, doubtless I’d find something to like there.